You'll be £4.99 closer to your next £10.00 credit when you purchase Into the Jaws of Death. What's this? Between the Crimean War and the dawn of the 20th century, the British Army was almost continuously engaged in one corner of the globe or another, in military operations famously characterized by Kipling as the 'savage wars of peace'. In his new work on the most dramatic Victorian campaigns Mike Snook bring's the most dramatic clashes of the age of empire back to life. Here focuses closely on defeat and disaster - the occasions when things went badly awry for the British. The names of these great battles - Isandlwana, Maiwand, Majuba Hill, Khartoum, Colenso, Spion Kop and Magersfontein still resonate down through the ages. In a meticulously researched military history, the author exposes the true and sometimes embarrassing causes of defeat. Overstretch, political meddling, military incompetence and petty jealousy all played their part. Above all else, however, these are dramatic and perceptive accounts of mere mortal men struggling to deal with the often overpowering dynamics and horrors of 19th-century warfare on the fringes of Empire. A level-headed amalgam of topographical good sense, unflinching tactical analysis and lived knowledge of that indefinable thing, regimental tradition. An enthralling look at the Victorian Army in adversity. Snook shows that incompetence, political interference, and jealousy all played their part in battlefield mayhem, often with tragic consequences. 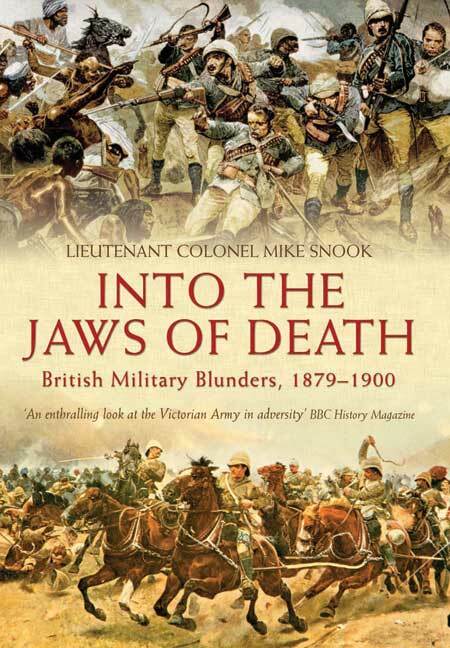 'Into the Jaws of Death' vividly brings to life the experience of colonial warfare with new insights into the characters of some of Victorian's most notable military commanders and also includes tabulated orders of battle for all combatants. Between the Crimean War and the dawn on the 20th Century, the British Army was almost continuously engaged, in one globe or another, in military operations famously characterised by Kipling as the 'savage wars of peace' . From Cairo to Cape Town, hard-pressed handfuls of British soldiers flogged across often impossible terrain , and overcame a raft of resourceful enemies to battle. When at length the protagonists met at close quarters, there were often startling, unexpected and violent outcomes. In his new work Lt Col Mike Snook deploys his professional expertise as a soldier, in concert with his lifelong study of British military history , to bring the most dramatic clashes of the age of Empire back to life. The names of these great battles â€“ Isandlwana, Maiwand, Mujuba Hill, Khartoum, Colenso, Spion Kop and Magersfontein still resonate down through the ages. In a wide ranging and meticulously researched military history, the author focuses closely on defeat and disaster â€“ the occasions when things went badly awry for the British. Overstretch, political meddling, military incompetence and petty jealousy all played their par. above all else, however, these are dramatic and perceptive accounts of mere mortal men struggling to deal with the often overpowering dynamics and horrors of the 19th-century warfare on the Fringe of Empire. From time to time over the past 350 years Britain has asked too much of its Army, especially when it has been deployed with too few resources to make war in faraway places. In the face of thrifty politicians largely insensitive to their needs, brave soldiers have improvised, adapted and, for the most part, overcome. â€œOnly at times of crisis does the wider public begin to comprehend what extraordinary demands have been made on the military and what miracles are being worked in its name by tine handfulâ€™s of soldiersâ€ writes Lt Col Mike Snook, R Welsh, in the preface to his new book on the military blunders of the late Victoria era. The author, currently serving at the Defence College of Management and Technology at the defence Academy, Shrivenham, is an expert on the Zulu Wars, on which he has written three well received books. He concludes that military disaster is almost traceable to political indifference of the neglect of the high command. All too often one or other is exposed by the fact that extreme adversity usually brings out the best in British soldiers. Where others might withdraw, they fight to the last bullet, for which reason the British public takes â€˜a peculiar pride in the Armyâ€™s off-daysâ€™/ Occasionally however military disaster is an indication of systematic failure, no more so than in the last years of Queen Victoriaâ€™s long reign and particularly in the Boer War. Mike Snookâ€™s clinical analysis of heavy defeats at Colenso and Spion Kop points the finger of blame at generals who had little grasp of what they were getting themselves into. Of Gen Sir Charles Warren, who commanded at Spion Kop, he writes of their failure to think ahead: â€œâ€¦it is extraordinary that no follow up plan was laid, either by Warren or Buller. It is such a fundamental omission that it is difficult to avoid the conclusion that we are dealing with the men who, while they enjoyed the pay and laurels of general officers, possessed few of the requisite attributesâ€. Hard on the heels of humiliation at Colenso, their miscalculations, confusion and inept leadership at Spion Kop cost the lives of hundreds of their soldiers, particularly of the Lancashire regiments, who were left exposed to lethal Boer artillery despite occupying the supposedly battle-winning high ground. Ironically, the British losses were mirrored among the ranks of the burghers, who were streaming away from their side of the hill as Warrenâ€™s badly mauled battalions scrambled down theirs. A golden opportunity to smash through the Boer line along the Tugela River and relieve besieged Ladysmith was lost. The men who died in their trench on Spion Kop lie where they fell in a war grave tendered today by the Republic of South Africa. The author reserves some of his strongest criticism for Fd Marshal Lord Wolseley (â€œundeniably a nasty piece of workâ€), whose hand picked â€œringâ€ of generals owed their appointments to his patronage. Three â€“ Buller, Colley and Butler â€“ â€œcame within a hairâ€™s breadth of losing South Africaâ€, concludes the author. But the defeats tool their toll and the Wolseley Ring was seen to have had its day. The defeat of the Boers fell to a man Wolseley hated as a "scheming little Indian", Fd Marshal Lord Roberts, and to his newly appointed chief of staff, Major General Lord Kitchener of Khartoum. Colonel Mike Snook was commissioned into the Royal Regiment of Wales and over the ensuing 30 years served all round the world in command, operations and intelligence appointments. He spent two thirds of his career overseas and saw extensive active service in four campaigns. He is a graduate of Leicester University, Sandhurst and the Army Staff College. Twice honoured for operational distinction, he was awarded the MBE in 2000. He spent four years as a British military adviser in South Africa and latterly was the head of the UN’s J3 Operations staff in Khartoum. A recognised authority on the military history of the Victorian era, he is the author of How Can Man Die Better: the Secrets of Isandlwana Revealed, Like Wolves on the Fold: The Defence of Rorke’s Drift, Into the Jaws of Death: British Military Blunders 1879-1900 and Go Strong into the Desert: The Mahdist Uprising 1881-5.